I was in the cloud nearly all day, which was a shame as this seemed like a really nice place to walk. I wondered what views I was missing. Unlike the first day (Thursday), when I saw nobody, I did bump into a few fellow walkers. They were all the sort who said hello and maybe stopped for a brief chat; which I am sure would not have been the case if the weather had been better. I did titter to myself when one young man emerged from the mist and said “Oh, thank goodness I’ve met someone and now know I’m on a path!” as if meeting me was a sound navigational achievement! 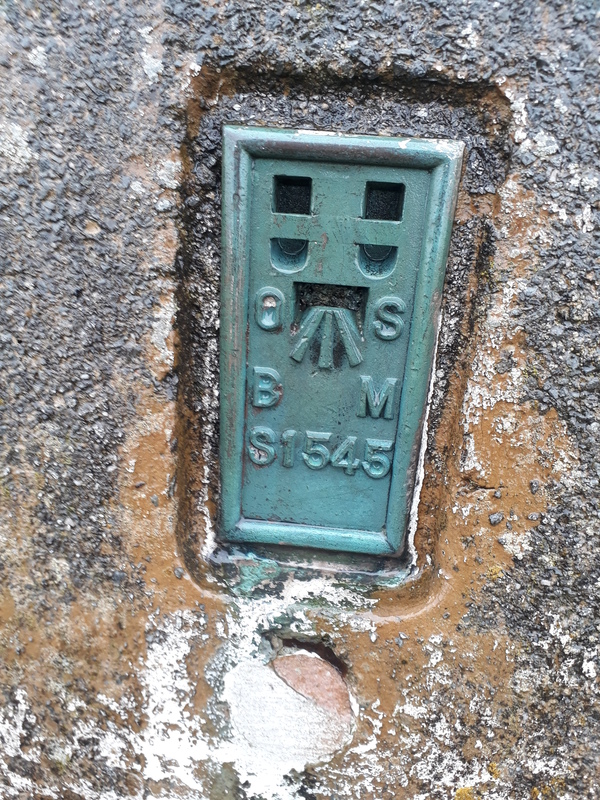 Although Cadair Berwyn would take me off on a Southerly detour and I would have to retrace my steps, I was curious to see if there was a Flush Bracket on the Trig Pillar. It does not appear to be listed in the Ordnance Survey’s published list of benchmarks but Alan had sent me photographic evidence that it existed. I found it and am now wondering how many other BMs are not listed? Even a concrete triangulation pillar is a welcome sight on a day like this …. Although I was enjoying my walk, time and impending darkness were now starting to niggle me. I wanted to camp within easy walking distance of Llangollen so that I could catch a bus to Wrexham in the morning but, realistically, I did not have enough time to reach my planned camp site before dark. 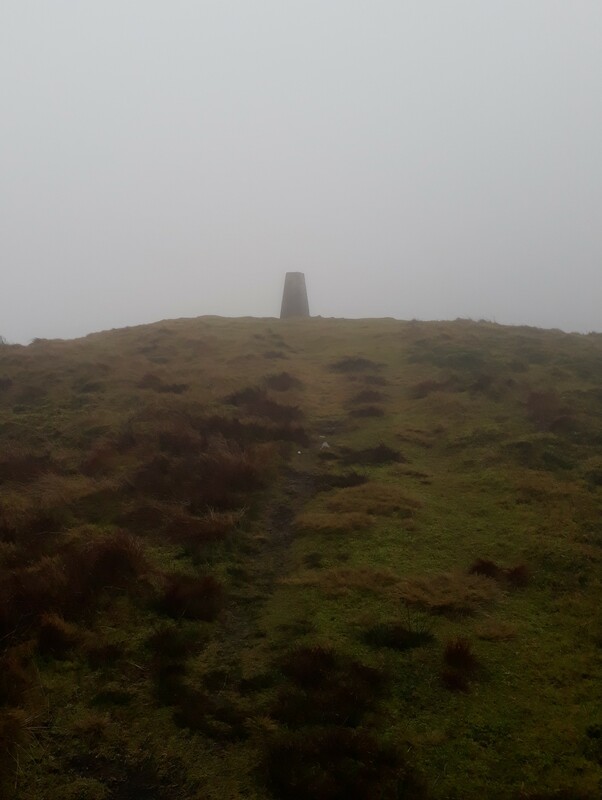 At the Wayfarer memorial I had planned to carry on following the county boundary, NE to the Ceiriog Forest, but could not easily find a path to follow and did not fancy the idea of finding my way through the mist. Instead, I followed the track SE past the derelict Shooting Hut then up the hill to Pen-plaenau. If I could at least get down to the river at Dolydd Ceiriog I could fill my water bottle and weigh up my options for camping. 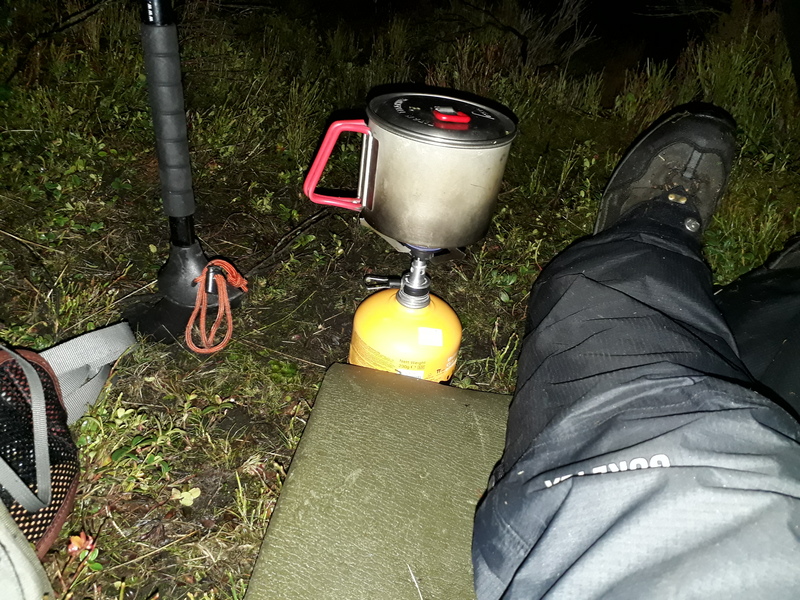 I don’t mind walking in the dark and, as I looked – on the map and on the ground – for possible places to camp, I weighed up whether there was any reason why I should not carry on walking. As the light faded I realised that I would have to camp now as it was becoming increasingly difficult to see any clear patches amongst the heather at the side of the track. I could find myself in the situation of spending the night in my bivi bag lying on the track if I did not make good use of the available light to fashion some sort of shelter. I also knew that the track would be safe to walk on in the dark in the morning so it was probably better to stop now and be up early tomorrow. I found a rough patch of stony mud not far from the track. It looked like it had been cleared, as there was lots of cut/broken heather, and the ground was bare rather than covered in the moss that grew in other places. It was too late in the day to be fussy. Foregoing any attempt to build a perfect shelter, I knew I just wanted something watertight, windproof and with enough room to spend the night comfortably. The resulting shelter was basic and the type I refer to as a Squashed Toad. I pegged out the middle of one end and put a walking pole at the middle of the opposite open end. I then used tie-outs all round, and a lifter at the back, to keep the tarp roomy and taut. I was pleased, during a nocturnal trip to the bathroom, to see that the light rain was blowing over the back of the tarp – so I’d obviously pitched my shelter the right way round. Despite the shelter’s basic configuration and the pretty awful location amongst the heather I was warm and dry with enough room to do everything I needed to do. I also had the pleasure of being able to see the stars for a few brief periods during the night. Flash-lit photos of black tarps never really work out well, so there are no photos of the entire shelter, but here’s a photo taken at 5:15 pm of my first cup of tea on the stove! I missed having a groundsheet but used my map case, sit mat and gaiters as an impromptu carpet. Some annoying tarp flapping in the night was resolved with a couple of clothes pegs! At 6am I listened to the news and lit my stove for a cup of tea. By 7:25 I was walking up the track with my head torch picking out the potholes and bigger rocks. I’d altered my plan and was now going to walk to Glyn Ceiriog, rather than Llangollen, and catch the bus back to either Chirk station or Llangollen. There were only two unknowns …… the bus times and the train times. With no phone signal, I had no way of finding out what my travel options were. I’d made a note of some bus and train times before I left home but was now relying on a different bus running to a convenient schedule for me to meet a different train. Guessing that the bus would only run every 2 or 3 hours I was going to need luck on my side. I was surprised at how long it took the sun to come up. The cloud was low and it was nearly 9 o’clock before I felt like I was now walking in the day rather than the night. My route would take me through the Ceiriog Forest and I felt slightly anxious in case the tracks on the map did not exist on the ground. I’ve had some bad forest experiences! Fortunately, the tracks were pretty much where I expected them and only had minor obstructions. At Glyn Ceiriog, just after 10 am, I checked the bus timetable and found that the next bus was at 11:40 reaching Chirk at 11:54. This could be OK as long as there was a train at around 12 noon. What should I do? Wait in Glyn Ceiriog for an hour and forty minutes and hope that the bus met the train? Or start walking and see if I could get to Chirk before the bus ….. and hopefully get a phone signal on the way? I chose the latter. A milestone said Chirk was 7 miles and I was hoping to walk that distance in an hour and a half. Unlikely, but I’ll give it a go. I could always get the bus anyway if necessary. At Dolywern village I managed to get a wifi connection and checked the train times. Oh, great! The bus would get in at 11:54 and my train was at ….. wait for it ….. 11:48 with the next one at 12:49 (which would give me about 25 minutes to have a shower, some lunch and get to Prenton Park). Common sense should probably have told me to give up and just wait for the bus but I kept walking. Maybe someone would stop and offer me a lift? Maybe I would find an abandoned bicycle? Maybe there was an additional 5th-Saturday-in-December bus? Anyway, I had nothing else to do so I kept plodding with an occasional attempt at an ineffective and ungainly jog. Although I no longer had an internet connection I rechecked my phone’s web browser and noticed that the National Rail journey planner had said that part of my journey was subject to delay. I had no further information but it gave me hope. I reckoned I’d reach Chirk station not long after noon, if I walked, and it’s not unusual for a train going all the way from Cardiff to Holyhead to have a 10 or 15 minute delay. At Bronygarth, where Offa’s Dyke Path crossed the road near Chirk Castle, there was a bus stop; the first I’d seen for over 3 km and I took it as a sign that I should stop walking. I still had 3 km to cover in 8 minutes and the bus was due soon. If there was any chance of the train being late then I needed to be there as soon as possible and I was grateful that the bus came on time. Due to parked cars, the bus had to stop a few metres further away from Chirk Station and I resented the extra walk. Eschewing the bridge benchmark for a second time, I peered down at the platforms and was pleased to see over a dozen passengers all looking a little grumpy. Quickly scanning an incredibly wordy bi-lingual sign I found the important bit “…. over the footbridge to Wrexham and Chester… “. Yes, all those grumpy people were waiting for the 11:48 and it was now 11:55. The train actually departed just after noon, so it had been the right decision to catch the bus for the last couple of miles. With hindsight I could have stayed in Glyn Ceiriog for an hour and a half, but hey ho! By the way, I made it home in good time for the match …. which was as dull as ditch water ….. and I know all about ditch water. It goes dark early in winter; so I need to be more realistic about how far I can walk and identify potential camp sites in advance. Adding additional tie-outs to the tarp, and leaving them in place, will speed up pitching and adjustments. The “envelope” tarp configuration works well as long as the wind stays in the same place. A simple adjustment can cope with a minor change of wind direction. In rural areas, download all relevant bus and train timetables to my phone in advance. This entry was posted in Camping, Gear, Walking and tagged Alpkit Rig 7, Chirk, Glyn Ceiriog, OS Benchmark, Tarp, Tranmere Rovers. Bookmark the permalink. Hi. As ever I enjoyed reading your post. I agree with you about sleeping under a tarp and the experience it provides. Plus, I like being able to get under cover quickly when it gets gnarly and then sort out my stuff in the dry – something I find a tent is not so good at. However, your choice of Bivi intrigued me. I have a MLD Superlight, which I guess is pretty similar to yours in that it’s not actually waterproof, so in winter I’d opt for the Vaude Bivi 1P for the added weather resistance on a “just in case “ basis. If you recall I have asked you some questions about yours when I first got mine a few years back. Anyhow, I wondered if you’d booted the Vaude into touch or the bivy you used is more weatherproof than I guessed or……….? The trouble with the Vaude bivi is it is neither a bivi nor a tent. It does not have the space inside to live comfortably out of the weather, but nor is it a “simple” waterproof bivi bag. As soon as you unzip the side the rain can get in, so you either have to stay zipped up inside or put a tarp over it. I’ve not yet used the Vaude with a tarp, but probably wouldn’t want to carry the extra weight when my TN Moonlite bag only weighs 180g. Does that make sense? Perfect sense! I usually use a tarp with mine to give a bit more room as there no weight penalty as I often use a poncho tarp as rain gear. Failing that, I use a microtarp pitched as a simple leanto with the side to the ground on the same side as unzippered side of the Bivi. It gives just enough room to allow the bivy door to be open, get changed, cook, etc. I’ve thought about using my micro tarp like you describe with the Vaude bivi. I will do, at some point. Btw, the Moonlite is about 180 grammes not 108! The microtarp does make a surprisingly useful amount of extra space. Chuckle, poor misinformed yoof, lycky he met you on a good day. More great stuff. Thanks for the read! Awesome Judith. Oops I mean Benchmark Barney.